I paid a surprise visit to Johnny's Kit Kat Club on the west side of town. That's me in the middle. It's kind of funny, I'm not a celebrity and none of these ladies even knew me. But I went on the reverse psychology principle that if you wear a bathrobe and pajamas, they'll think you're someone. And man, did they gather around! You can see I took advantage of their momentary confusion to set out mason jars to gather up some of the vibratory essence of these women. At least I hope they're women. Sometimes the Kit Kat Club swings several of the other ways. But whatever, with looks like this, whatever they are, I'll make do! Which one shall I do first? I think I'll go with the blonde. This is my current thing, riffing off of some of Swami Masturbananda's teachings and practices. If it's true that our vibratory essence or energy lingers after we've gone, then it stands to reason we might collect some of it for storage and later use while we're there. How exactly that should be done, though, is what I don't really know; whether it would take some kind of battery, it'd help to have some scientific input. Barring that, I'm just doing the best I can, with at least a plausible idea that collecting the energy in jars might work. Then what you do with the energy, of course that's your business. Since I'm a follower of the swami, my own interests lie in seeking better, more sustained ways of glimpsing the divine consciousness. Swami Masturbananda's teaching is different from many other holy men, in that he believes the divine has given us a particular means of reaching the higher consciousness, at least for eight to 10 seconds at a time. I've been giving this a lot of thought, and if, maybe with the jar method we can prolong that time, who knows what other breakthroughs we might make? So I collected the energy from these showgirls earlier this evening. And other than that, I set jars at various places around town today. Then after I left Johnny's I went and retrieved them. One place I was today, I saw a cute woman sitting in a car. She had on a blue shirt. I set the jar by her door, then crept away. I figured she'd be gone after a while and no harm would come to her. 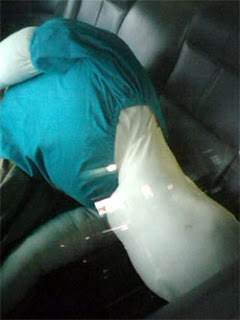 But I was obviously mistaken, since when I returned to get the jar, this is what I saw in the car, the same blue shirt, but her body apparently nothing but some kind of white mush. She had completely collapsed! Of course I got the heck out of there! And I'm trusting that no one will report the incident to the police, because they might not understand that I haven't got all the scientific kinks worked out of this method of capturing a person's essence. This is the first time I've ever seen this happen, so perhaps I'll be more careful next time. I'm definitely going to be careful to label that particular jar, because if I took the complete life force out of her, there's no telling what might happen when I open it some night! I wouldn't blame her if she's hard to handle and a little ticked. But hard to handle's what I like! Because what better to sustain the glimpses of the divine consciousness than having a partner on the warpath! I might have to open the jar just a crack and see what a little bit's like. Anyway, the more I experiment, the more I'm going to know. And I'm ready to get to it. I need to write up this report for my own records and also in case I'm killed; I'm going to need someone surviving to dispose of these jars, or at least get them to the Swami, because he won't have any trouble with them. Assuming I survive, I'm thinking along these lines: Mixing different essences for unique experiences and/or for greater intensity. Plus, I'm thinking about putting some kind of "bait" in the jars -- like a diamond or a $20 bill -- to entice the energy to gather in greater quantities. There's all kinds of things that are going through my mind. Again, my purposes are lofty, what we can glimpse right at the heart of existence. And no one can fault someone else's religion. Friends, it's nearly time for me to retire -- not to sleep, but, well, I'll leave that to your imagination. I'm saving time already, since I'm already in my PJs.